While exercise may be the last thing you want to do if you have arthritis, it may actually be the best thing could do. While arthritis pain may make movement seem like it’s going to make things worse, a new study from the U.K. indicates that the opposite is true. Not only can exercise improve your arthritis symptoms, but it can also significantly lower your risk of cardiovascular disease. 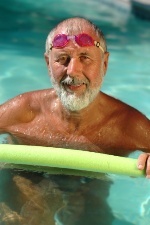 While arthritis pain can inhibit motion, forms of exercise can be tailor-made to any condition. If you can, work with a personal trainer one-on-one. That was the method used in the British study on 40 patients with arthritis. All the patients were about the same age and same gender and had the same body mass index. They were put into either an exercise group (receiving six months of individualized aerobic and resistance high-intensity exercise intervention three times per week), or a control group (receiving advice on exercise benefits and lifestyle changes). Participants were assessed at baseline and at three and six months for aerobic capacity and individual heart disease risk factors (including blood pressure, lipids, insulin resistance, and body composition). They were also measured for arthritis symptoms and disease progression. The researchers found that all variables were significantly improved across the board for those in the exercise group compared to the control group. According to the researchers, those who improved their cardiorespiratory fitness had the strongest improvements in all of the assessed heart disease risk factors. If you suffer from arthritis, consider participating in an aerobic and resistance exercise program designed specifically for you. You could significantly boost your heart health and improve your arthritis symptoms at the same time. Stavropoulos-Kalinoglou, A., et al., “Individualised aerobic and resistance exercise training improves cardiorespiratory fitness and reduces cardiovascular risk in patients with rheumatoid arthritis,” Ann. Rheum. Dis., November 15, 2012.